English is a West Germanic language. It was first verbalized as a language in early medieval England. Nowadays English has proudly become a global communication tool. It overcame French right after WWI when those three political leaders British Prime Minister David Lloyd George, United States President Thomas Woodrow Wilson and French Prime Minister Georges Clemenceau were dividing the after-war world into the zones of interests. Two of them Wilson and George were native English speakers and they convinced Clemenceau who spoke good English to conduct all the discussions and process the paperwork in English. That's how English replaced French which had been an official language for international documents and communications. Since then English has started its dominant marching over the planet. 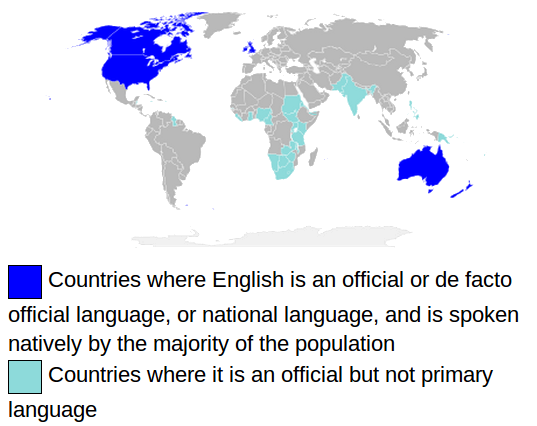 English is spoken as a mother tongue by majority of population in countries like the United Kingdom, the United States, Canada, Australia, Ireland, New Zealand and a few Caribbean countries. This language is an official language in more than 60 countries. In the global language race in the “Number of native speakers” nomination English is finishing the third after the two leaders Mandarin Chinese with its 1 billion of native speakers and Spanish which is spoken by more than 500 million people around the globe. English is being most studied as a second language in thousands of educational institutions all around the globe. English is an official language of numerous world's organizations like the European Union, the United Nations and many others. This language is an international communication bridge, ground for most computer languages and an obligatory entry in one's resume for those pursuing a serious career.